When MyCoporation ran the one-week free Inc and LLC registration promotion early this month, I took the opportunity and filed my own LLC registration with them. The reason for me to decide to form an LLC for my busness is, of course, for benefits on taxes and protection. You may not be familiar with MyCorporation by the name, but I am pretty sure you have heard of products such as the tax preparation software TurboTax, personal finance management software Quicken and the recently free-for-all Quick Online service. If that’s the case, then MyCorporation shouldn’t be a total stranger to you because it is also part of Intuit, the company behind the above mentioned software. What MyCorporation does is that they help small business owners file necessary documents to form a corporation or limited liability company without having to heir a lawyer. In addition, MyCorporation also provides services in trademark searches and applications, copyright registrations, DBA registrations,etc. Registering a LLC or Inc with MyCorporation is quite easy and straightforward, taking me about 30 minutes to complete. First you will need to provide your Contact & Entity Info, including your personal Contact Information such as name, mailing address, email address, LLC Name, LLC Business Address, and Register Agent, where I chose to let MyCorportation act as a Registered agent. LLC Members where you provide information of LLC members, aka owners of an LLC. In my case, I am the only member of the LLC I registered. At the third step, you need to specify Initial Capital Contributions for your LLC. This is the initial investment to get your company started. You can put whatever amount you want and if you have more than one member in your LLC, each member can make a contribution which is also used to determine voting rights and how profits are distributed to members. Get a Federal Employer Identity Number (EIN). If your LLC hires employees or has multiple members, you are required to get an EIN. You can either to get one yourself, or let MyCorportation get one for you at cost of $69. 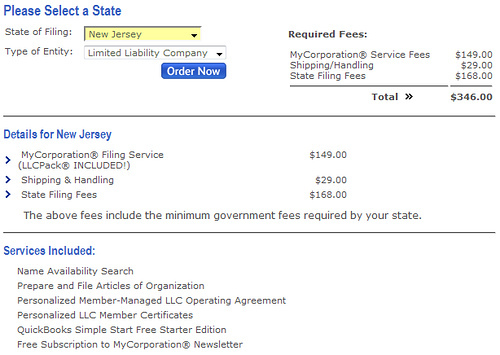 At this step, you can choose some options that MyCorporation recommended, including filing options (Standard $168, Rush $318, or Delayed Filing), compliance services (whether to let MyCorporation file annual report for you ($98 for New Jersey) or do it yourself), and a couple of other options that I don’t think are necessary. Finally, you can review services and products you ordered. There are services that you can’t remove, including MyCorporation Formation Services $149, Government Filing Fee $168 (this fee for your state may be different because each state has its own requirements on forminga LLC), and Shipping and Handling $29. Except these, all others are optional. During my registration process, I didn’t take any optional service or product because I don’t think I need them at this moment. So in my order I only have the three required services in Step 6. However, since the order was placed when MyCorporation was running the promotion, I was able to save the $149 MyCorporation Formation Services fee of $149, bringing the total cost down to $197. Shortly after I submitted my order, a representitive from MyCorporation called me, saying that filing with New Jersey will take about 30 to 4o business days and I should receive my package late next month. From my experience, forming an LLC with MyCorporation is easy (MyCorporation is just a filing agent, they don’t provide legal or financial advices), as long as you know what you want, because it takes care of the details. If you are thinking of getting your own LLC or Inc with MyCorporation, you can save $149 as I did if you act before January 1, 2009. After the successful promotion at the begining of December, MyCorporation has extended their free filing offer to December 31, 2008. To get your free filing, use this link to go to MyCorporation and use coupon code MYFREE to save $149 filing fee. Really not pleased with this service. Thomas: Thanks for sharing your story. I only had one phone call with them after submitting my request and all others were done on the net, so I don’t know exactly how bad it is. From your experience, it seems that they aren’t that good at all. Now I am hoping my application can go through without incidents. I formed an LLC a couple of years ago via MyCorporation and so far I’m a bit disappointed. Of course I could do this myself manually but the idea is to save time so I can concentrate on my business. 1. In the past two years I have sent emails to their customer service to receive none back; I moved and needed to update location and phone info. In today’s age of Internet and online businesses they are behind in implementing the right technologies to support, promote and really run this service to the best potential. Hopefully they will make the appropriate choices and do this ASAP. I had excellent service, great timing and the most exceptional overall experience. I was incorporated in weeks and my lawyer said it would take a couple months…it got done and it was perfect. You can certainly do the work yourself, but they know how to get it done and they do it fast!